Like all eager freshmen, I came to college wide-eyed and hopeful about entering the next stage of my life. Many of the adults in my life would tell me, "college is the best time of your life." "Bring it on," I thought. I was going to become a real adult. Find my life calling. I was going to dive deep into my work, define my interests, hone in on my talents, and make my life long friends all at the same time. Even now, these expectations seemed idealistic not unrealistic. Without a doubt, I have had many academic opportunities that have challenged me to think about, analyze, and discuss complex issues. I have taken incredibly interesting and engaging classes and gotten involved in organizations on campus. But, I found my priorities to be out of whack. No matter what I did, schoolwork and grades is always the end all be all even though it is only part of the equation. Yet, it's where I spend most of my energy and time and any time invested in reading a book for pleasure or hanging out with my friends just chatting during the school week is always accompanied with a pang of guilt or stress because I was not studying. I have spent a lot of time worrying and trying to figure out what I am good at and what I am already passionate about, afraid to venture into unfamiliar territory. I had to ask myself, am I really growing or am I instead actually shrinking? It wasn't until I took a class entitled, "Social Entrepreneurship in Action" this past semester that I had a truly transformative learning experience and discovered what college was all about. I stopped searching for that thing I was good at or for my passions and I found a purpose. My grades in the class were much less important than my relationships with my classmates and the potential impact of my social entrepreneurship project. I had always shied away from classes that could have anything to do with business or finance. I have just always told myself I am just not business oriented. However, the decision to take this class was the best one I have made throughout my time here. Hearing from social entrepreneurs, developing business skills, and building a strong class community with my peers allowed me to regain my confidence in my own abilities to be a difference maker. 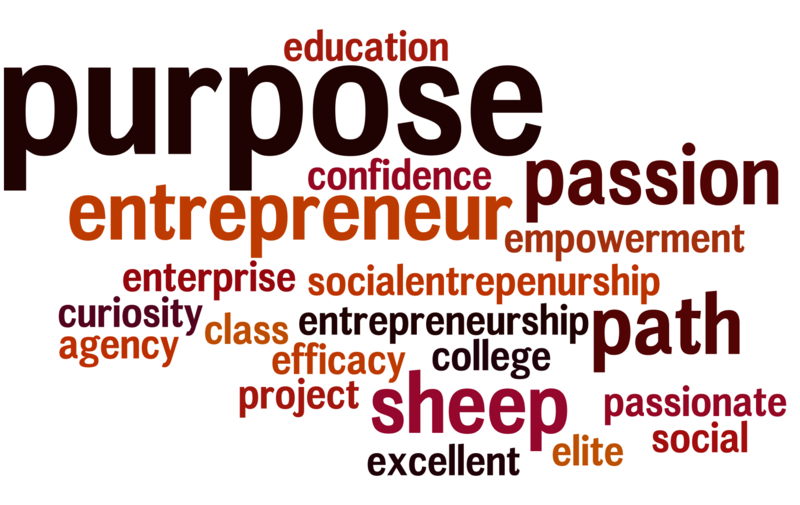 If there is a prime example of a "buzz" word these days, it's social entrepreneurship. But what's the meaning behind this catch phrase? It means something very different to different people. For some, a social enterprise is exclusively a non-profit, for others it is a for-profit driven by a social mission. George Dees describes the social entrepreneur as someone who searches for change, responds to it, and exploits it. Social entrepreneurship is combining the passion of a social mission "with an image of business-like discipline, innovation, and determination." Throughout discussions this class this semester, I have found that the feelings of disillusionment with the typical college experience are not uncommon among my peers both at Duke and at other private colleges and universities around the country. We come to college with a hungry curiosity but soon lose it and do not leave our comfort zone. In fact, William Deresiewicz recently published an article, followed by an entire book, Excellent Sheep, about just this topic. Through his interviews and research, Deresiewicz describes what he sees as pressing problems within the elite education system and what he refers to as the "miseducation of the American elite." Instead, he believes that students who attend public institutions are much better off. While I don't wholeheartedly agree with all of the points Deresiewicz makes in his book and I realize how fortunate I am to be here at this great university, I do find myself relating some of the messages and examples he lays out. I was particularly struck by his point talks about elite universities failing their students by emphasizing the path to success instead of a path to purpose. He describes students' loss of intellectual curiosity and graduating without knowing which way their moral compass is guiding them. He uses the example of a Yale student who albeit a veracious reader and hungry curiosity, had come to believe "there's a bigger social reward for being able to talk about books than for actually reading them." Learning in college is supposed to be about making mistakes and trying again and its about stepping out of your comfort zone. But, in an academic culture that demands constant achievement and in which failure does not ever seem like an option leads to what Deresiewicz calls "a violent aversion to risk." Taking this action-oriented class on social entrepenurship had helped me counteract this. In fact, one of the most important lessons I learned about the field of social entrepreneurship is that you can't be afraid to think big and fail. If you want to create real impact, you have to be willing to embrace uncertainty. Now in my second semester of sophomore year, I can confidently say that college has truly been a transformative experience but not because of the reasons I thought it would be when I stepped foot on campus and not until I began to look at my time at college through a different lens. As part of my social entrepreneurship class, two other students I began Girls' Hub, a community building program that fosters increased agency and self-efficacy in ninth grade girls in Durham, North Carolina. This semester, we will be launching the program at Northern High School, and I am excited embark on this journey with my teammates. This series will feature lessons learned through social entrepreneurship and how it is has influenced my college experience and my path to purpose.